Not a sight you thought you’d ever see, eh? 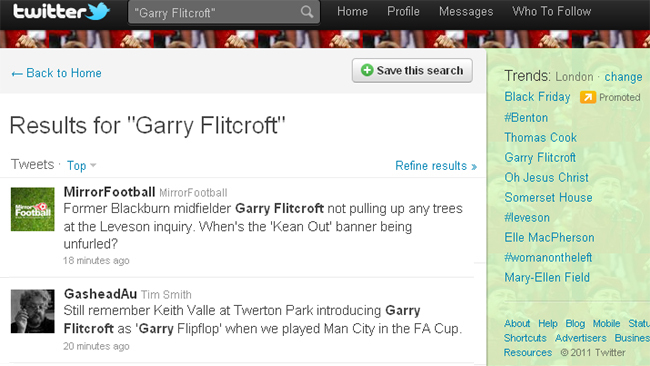 Indeed, Garry Flitcroft’s professional career ended in March 2006, four months before Twitter was publicly released. The reason for the blonde-haired midfielder’s return to the limelight is the Leveson media ethic Inquiry, with Flitcroft giving evidence. Back in 2002, the former Blackburn Rovers captain tried to stop the Sunday People naming him in a story which alleged he had indulged in a number of extra-marital affairs. Tragically, Flitcroft’s father committed suicide six years later, which the player attributes, to a large extent, to anxiety caused by the media frenzy.